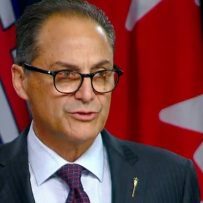 Alberta’s finance minister says the court decision putting the Trans Mountain pipeline expansion in legal limbo won’t affect the long-term plan to rid the province of red ink by 2024. Joe Ceci says the province is relying on revenues not just from the Trans Mountain expansion but other pipeline projects as well, such as the Line 3 expansion from Alberta to Wisconsin and the Keystone XL line to the U.S. Gulf Coast. “There are a number of assumptions, not just (Trans Mountain.) We have two other pipelines that are in play and will help us out in that path to balance,” Ceci said Friday after announcing numbers for the first quarter of this year’s budget. A Federal Court of Appeal decision Thursday overturned the approval of construction permits for the Trans Mountain pipeline, from Alberta to the B.C. coast. The court cited a lack of consultation with Indigenous groups and said the regulator, the National Energy Board, failed to address the impact on marine traffic. With a provincial election coming in the spring, Premier Rachel Notley’s government has tied its fortunes to the success of Trans Mountain as an example of the concrete benefit from its climate change plan, which includes a carbon tax on home heating fuels and gas at the pumps. Notley called on Prime Minister Justin Trudeau’s government Thursday to take steps to get the project back on track by year’s end and said until that happens Alberta will not sign on to the federal climate change plan. That means the province won’t agree to raise its current price on carbon from $30 tonne to $40 tonne in 2021 and $50 a tonne by 2022. But it also means the province would forgo $1 billion in revenue by 2024 from that tax – money that has been factored into the blueprint to balance the books by that date. The Trans Mountain project would double the existing pipeline to triple the amount of oil shipped to B.C., allowing producers to expand beyond existing U.S. customers to more lucrative markets on the Pacific Rim. Alberta is set to take in $4.7 billion in non-renewable resource revenue this year but is banking on that number more than doubling to $10.4 billion by 2024. Opposition United Conservative Leader Jason Kenney said it’s hard to believe that a moribund Trans Mountain and no extra carbon tax money under the federal climate plan will not significantly hamstring the NDP’s path to budget balance. Kenney also questioned the NDP’s approach of avoiding spending cuts to keep Alberta’s economy moving. “(The NDP) have tried to wish their way out of a huge deficit and debt and Albertans are going to end up paying the price,” said Kenney. The province has been running multiblllion-dollar deficits as the province rebounds from a prolonged slump in oil prices. Ceci announced Friday the rebound is continuing, with higher oil revenues and personal income tax money cutting $1 billion from this year’s projected budget deficit to a revised $7.8 billion. Spending remains stable at $56 billion. The debt by the end of the 2018-19 fiscal year is projected to be just under $53 billion. Kenney said it’s a spending plan that can’t be sustained, noting that the debt is expected to hit $96 billion by 2023. “Today’s quarterly update does nothing to change the fiscal train wreck of their budget,” he said.